I wasn't expecting much at our farmers' market in January. In fact, I was even happy to have one at all. But a sunny day beckoned and I found myself wandering through the stalls admiring the brassica, root vegetables, and cool weather greens, and . . . oh, lookee here! A squash that's already sliced open, flashing bright orange like a neon sign. No hatchet or chain saw required to get at the succulent flesh—and there are still seeds attached. I love seeds. So at this point I'm thinking, hmm, squash soup with toasted seeds as a garnish. Then I see some leeks. And shitake mushrooms. So it becomes a squash and caramelized leek soup, adorned with sautéed shitake and a few more leek curls, and garnished with toasted seeds. I also stop to get some Brussel sprouts. One stalk for dinner, and one for the SO to snack on, raw. Herschel (the headless) reports that Brussel sprouts will be coming on for several weeks yet. His family farms are in Paso Robles, Arroyo Grande, and Santa Maria. Then I stop at Maria's green stall. As always, she is yelling at people. You stop eating her sample, she yells at a young professional couple. You get your own! Hey, she yells at me. You like those pea tops? They good for salad. She throws a handful in a bin of greens. They good for stir fry. Another handful gets tossed on top of the snow peas. They good for you! You try one, now! So I leave Maria's stall with snow peas, pea tops, winter spinach, and arugula. Good thing they're light, because I don't have a cart—just a red canvas bag. After a few more stops to pick up local honey, olive oil and jam, I'm starting to waddle with my red bag and knock little old ladies over. A nuisance to society, I return to my SUV. Also loosely categorized as fresh . . . 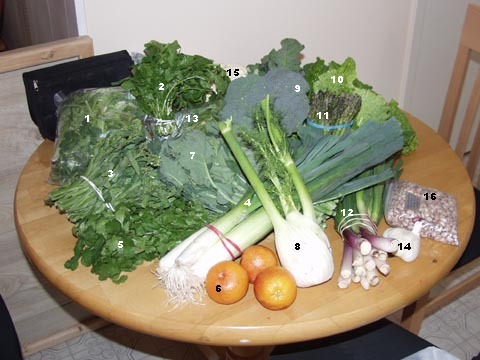 I havn't been to the farmers' market lately, cause the one that is close to where I live now is only open seasonally. When I lived in Roseville I used to shop at the same one (Sunrise Mall parking lot, behind Sears) that Jensen shops at. The great thing about the year round market is watching the offerings change from week to week and wondering when the asparagus, peaches, corn, tomatoes, etc. are going to show up. Here's a link to the California Certified Farmers' Markets site, where you can search for markets and their schedules by city or zip code. I have a sad story to tell about the market today. I sell at the Santa Monica FM and have since 1992. Today I was shut down by an over zealous Health Inspector even though the agencey with jurisdiction over me is the AG dept. We sell wild gathered mushrooms, truffles, greens and farmed Shiitake and Maitake. He said I needed to provide certificates from the pickers I use to verify they picked on State approved land . They then insisted we stop selling. B) There is no such rule any where in writting. C) He issued no violation because there was no code for said violation because it did not exist. D) He could provide no clear reason why such paperwork would be needed other than he said so. Yet my customers were told to leave and I was forced to pack up and leave. Just thought I would share this story with you all when I saw this thread. BTW in season now at my stand in SM and Hollywood are yellowfoot mushrooms, black trompette, hedgehog, black truffles. Our cultivated mushrooms are year round. I have a sad story to tell about the market today. I sell at the Santa Monica FM and have since 1992. Today I was shut down by an over zealous Health Inspector even though the agencey with jurisdiction over me is the AG dept. Does your market have an organiser/sponsor? (Not sure what word to use.) At my market, I often see "official" type people. Perhaps a call to them and maybe even your AG dept. rep could arrange for some back-up for when you go back to the market next week. That is one of my favourite aspects of the farmer's market. I was so excited to see Rebel Rose's photos of the brussels sprouts, as I've been waiting and waiting for them. I hope to see them this Saturday at the market! If I miss the Saturday market, I will sometimes go to the downtown market on Sunday morning. Even though it's much larger and has a greater selection, I really don't like it as much as the Sunrise market. The location is just horrible...there is no sunshine and far too much noise under the freeway! What I can't locate in the photo is what was described as "sweet broccoli". It looked like the gai lan but had very tiny broccoli heads on it. Great photos and thanks for reminding me that it is brussel sprout time of year. 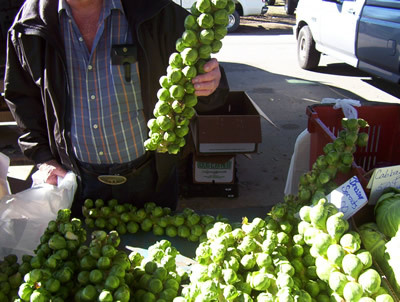 I may have to scedule a trip next Sat to the SF Ferry Plaza market and pick up some of Iacopi Farm's great brussel sprouts. There also seem to be some new vendors. 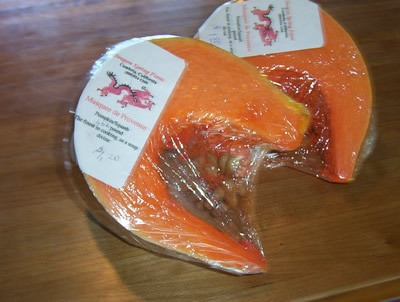 Has anyone tried Achadinha Cheese Company or the smoked salmon at Shogun Fish? Has Zuckerman's started selling asparagus at any Bay Area Farmer's markets? The SF Ferry Plaza market is still in full swing. I took some pictures while shopping all morning yesterday. Though I forgot to photograph my haul from the market, I came home with valencia oranges, meyer lemons, spinach, yellowfoot mushrooms, brussel sprouts, baby fennel, and pink lady apples. Love the Romanesco cauliflower shot...bought some myself in Long Beach today. I've had it every Sunday for the last three weeks. Absolutely addictive! How funny, me and my wife were just wondering (last night) if there were any farmer's markets open in the Napa area in April. We will be out there for a week. There are many, but the San Francisco ferry plaza market on Sat mornings is the one to go to - especially during the cooler parts of the year when there aren't enough vendors/customers to keep all the markets going year round. I'm insanely jealous of that mushroom display. In Irvine, fungi are sorely missing from the bounty of offerings. There is one stand that sells mushrooms, but just the basic garden varieties. They have nice shitakes, but I'm always hoping for more exotic varieities. Alas . . . 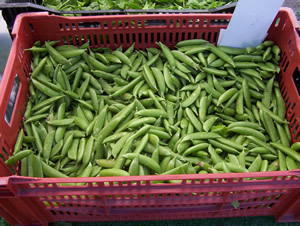 The Marin farmer's market on Sundays has many of the same vendors as the Ferry Plaza market. Even in the winter, it is a pretty extensive market. And the parking is better. I'll be traveling to SF in a week and always love to spend my vacation cooking from local farmer's markets... I'd love to know (being from Maine where almost nothing is in season at the moment) what people have been seeing for sale at the SF Farmer's Mkt (the Tuesday one as well as the Saturday). I'm trying to get some sense of what I should plan, menu-wise. What's out there that's in season in CA? How involved will you be in cooking? Are you renting a place with a kitchen that has all the cooking utensils as wel as major ingrediants like spices, eggs, oils, etc? Or are you just putting things together like salads, sandwiches, etc? In the Berkeley Farmers Market link above, I talk about my visit today and the veggies in season which are mainly greens and root vegtables (list at beginning of link). There was no fruit other than kiwis at the market I visited today, but I know that citrus is available at Ferry Plaza. There are some beautiful blood oranges this time of year. MAYBE the first strawberries will be creeping into the market. PERHAPS the asparagus will make an appearance. The market I visited today is very small. The Saturday market can be daunting. Here is a link to the vendors at the market. For a salad and fresh herbs stop by White Crane Springs Ranch. Ask for 'THE MIX". They keep it in back and if you don't know about it you'll miss it. It is salad greens all made out of herbs. Talk to the vendor. This is a unique product and delicous. Also, this is the only market that this vendor appears in and only on Saturday. For vinegar for your salad dressing - Bates and Schmidt - They have an oustanding apple balsamic vinegar ... Don't get the cider vinegar. It is ok, but not what you want in your salad. Nick Sciabica & Sons has the best olive oil. Tell them what you plan to cook and they will suggest the best oil. To take home, they have little samplers of various oils. I highly recommend the flavored oils. Hoffman's Game Birds have the best ckickens in the Bay Area. They sell out early. If you are not cooking your own chicken, you can get an excellent roast chicken at Roti, Roti. Happy Boy Farms has my second favorite salad mix with edible flowers. I think they are only at the Tuesday market. Iacopi Farm will have the best brussel sprouts this time of year. THey also have some interesting beans. Speaking of beans, Rancho Gordo has some lovely heirloom Mexican beans. Pozole anyone? Mariquita Farm has my favorite veggies and only appears at the Ferry Plaza Market and only on Saturday. The red carrots are great. Another vendor unique to Ferry Plaza and only appearing on Saturday is Small Potatoes. Wonderful ... well ... potatoes and many varieties of heirloom garlic. For cheese, you must stop by Andante. The cheese is named after musical terms. If they have it, the Figaro, covered in fig leaves is wonderful. Ask the vendor what is best this week. Marshall's Honey is not to be missed. Get the pumpkin blossom. Nothing in the world tastes like this. Ask what is in season. There are tastes of all the honeys. I like to give gifts of different colors and types of honey. Usually it will include the darkest honey ... wild, wild, west and the lightest ... usually orange blossom. And, of course, pumpkin blossom. June Taylor has the BEST jams and you can sample it all. The bing cherry has the true taste of cherries. She makes it from Langiers cherries, who is a Ferry Plaza vendor. Usually she puts a special kir in the jelly, but it was unavailable this year. It is still excellent, but that kir pushed it over the top. My favorite food stall for breakfast is Hayes Street Grill. Some vendors I personally avoid ... Miette pastries. Really inconsistant. You are paying big bucks for these very pretty cakes but the flavor is not there. I'm not crazy about many of the merchants inside the building. A few I like, Boulette's Larder, Ferry Plaza Wine (you can get flights of wine at 9 am ... the market scene can be brutal). Imperial Tea .. I love the red prosperity tea. Csar Niccoli Caviar Bar is fun. It has caviar samplers and usually some very good wines to go along with your caviar. Cowgirl Creamery has an excellent selection of Cheeses and right next door is Acme bread. In the Saturday market, I do like Downtown Bakery. If you have a car and have time and like Farmer's markets, go to the Alemany Farmers market after Ferry Plaza. It is the anti-ferry plaza ... the chickens are fresher than Hoffmans because they are live. You can get balut eggs at the egg vendors. Very ethnic. Very rock bottom prices. They are open until five. For the Ferry Plaza market the earlier the better. If you get there at 8 am before the official opening time, you beat the crowds and can pick up some unique items that might sell out early. Have fun in the city. I grew up in Connecticut and we would go to Old Orchard Beach in Maine to vacation. As Melkor showed and Krys mentioned, citrus is in full swing right now. If you haven't tried Meyer Lemons, make sure you do so! Don't know what your facilities wll be-- but any dessert that features lemons would be nice, lemon-syrup soaked cake, lemon mousse, etc., candied lemon zest, lemon tart... If you have space, these are easy to bring back as well. Other interesting citrus items that should be available: blood oranges, (nice in a sweet salad or savory Sicilian-inspired salad), kumquats and tangerines (tangerine mousse is wonderful). Nice dates should also be available. I haven't been to the market for a few weeks, but I went Wednesday (Feb 9th) and saw your vacant space and the cryptic sign. So what's happening with all this? Is there anything the shoppers can do? This just seems so weird. I'm terribly sorry you're having to go through such nonsense. Nice dates should also be available. Thanks ludia. I forgot about Flying Disc Ranch since I don't buy dates that often. They should be in full swing about now with about a dozen varieties of dates. I also forgot about Van Mouriks's almonds and nuts. Absolutely the best, THE BEST, almonds in the world. I give these for gifts at holiday times. The reason they are so good is that after the nuts are harvested they go into cold storage. Then they are roasted prior to sale. This makes a lot of sense when you think about it because nuts have a lot of oil and oil can go rancid. If you roasted the nuts prior to refrigerating, well, it wouldn't be as good. I don't see them on the list of Ferry Plaza vendors. If Ferry Plaza dropped them, I would lose quite a lot of respect for that market. However, I see a fev vendors are missing from the list like Rancho Gordo and there are a few vendors that have long ago left the market because they sold the farm. Depending on your facilities, The Pasta Shop sells nice ravioli's, sauces etc. There are samples, as there are at many of the vendor stands. I particularily like the butternut squash. Oh, yes, bring LOTS of cash. It isn't cheap here. I've been known to drop $100 on a single trip. There are some bargains if you look. One of the best vendors in terms of price is McGinnis Ranch. I love his raspberries, red and golden, in season. Lovely little summer squash also. There is a rush when the market in the morning for his flowers. Poor Howard can barely get them off the truck when people a snapping them up. As I said, great, great prices and wonderful quality. Hmmm, I've been longing for dafodils, maybe I should drop by and pick some up this week from Howard. As melkor mentions, there is Far West Fungi for mushrooms. They also have a shop inside the building where they have quite a few glass jars of dried mushrooms. As the Ferry Plaza web site says of Far West "The array of wild mushrooms changes seasonally. In late spring there are fresh Morels and mountain-gathered Porcini, followed by Chanterelles and a selection of domestic and imported truffles. Dried mushrooms include Italian and domestic Porcini, Morels, Fairy Rings, Candy Caps and Matsutake. " Mmmm... wild mushrooms fried in Straus creamery butter. Or a quiche using the mushrooms and Petaluma Farm's pullet eggs. Ask Stan how he is doing today ... and he will tell you "Eggsellent". He never tires of saying it, I never tire of hearing it. I think I just planned my own menu this week. Thanks for the reminder. I am just SO ready for spring. I have strawberry dreams ... Actually, last year at this time, I lived in the San Diego area and the first strawberry stand opened in January. Cool little shack surrounded by berry plants. Hi Emily, We are still in the process of obtaining a permit. If we are unable to return to the market we will start a pettition and letter writing campaign. We still hope to resolve this without a big fight. We have made some very sound arguments as to why we should be allowed to return as long as there are hundreds of other food establishments selling or serving this same exact product. Hopefully we will return next Saturday the 19th. Weds is supposed to pour down rain so we will not try to push for resolution Monday or Tuesday and settle for Weds or Thursday. Thank you for your support. The outporing of support from both the market and all my loyal customers has really helped us cope. We do need to get back to business though and people need their mushrooms. Please be sure to post here and/or PM me if you need signatures or letters. I'm sure there are other SoCal market-goers here at e-gullet who would be happy to help. Life without good mushrooms is no life at all! I'll be staying with a friend, so I will have a full kitchen at my disposal. Can't wait to hit the market! Thanks for the website Pamela. I've already got my markets planned out for the week. I live in San Diego and the few farmer's markets I've been to were just okay. Does anyone know of one that is on par with the SF Ferry market? I'm totally envious of that one. If you have a car and have time and like Farmer's markets, go to the Alemany Farmers market after Ferry Plaza. I just noticed this thread. I live a few blocks from the Alemany Farmer's market and just love it. It has many of the same vendors as the Ferry Plaza; but, usually much cheaper prices. Almost every Saturday, my wife and I trek down, buy most of our produce for the week, pick up tamales for lunch, and most of what we are going to make for dinner Saturday night. Asparagus is just starting to show up, we have a fantastic new cheese vendor (Spring Hill Cheese), and just this week, a guy roasting peanuts to order! Also, one of the first vendors on the right sells the most amazing fresh California grown Kiwi Fruit. We like to get the giant mis-shapen double kiwis, which for some reason they sell for less ($1 a pound this week). Anyway, I'm willing to bet that after tasting their Kiwis, you will swear that you have never really tasted a Kiwi. Also, someone said above that it goes until 5 in the afternoon. While it is true the hours are from Dawn to Dusk, a lot of the vendors start packing up shortly after noon. You can get some good deals in the afternoon; but, you will miss out on a lot of the more desireable items. Next week, I will try get up earlier and take photos. As promised I will put up some photos from last week's Alemany Farmers' Market. This is our fish stand. Most of the fish is whole and still kicking, so I've never been brave enough to give it a try. This Blue Crab seemed particularly fiesty. One of the mostly citrus stands sells these guavas. I am not sure what kind they are. I tried one the other week, and they are white inside. My personal favorites are the "Pineapple Guavas," which have the most unusual flavor. There is a great and incredibly reasonable flower stand. Hazel Dell, who also have a stand at the Ferry Building, often have some fantastic mushrooms. A couple a weeks ago we got some Black Trumpets. Oh my gosh were they good. One of the other highlights is that Jackie Floyd Jones has recovered from her surgery and is again back with her singing saw, dancing cat, and keyboards. Lots of sunchokes right now. Made a fantastic gratin of sunchokes for Saturday night dinner a couple weeks ago. We also get lots of unusual "ethnic" ingredients like various taro. However, you will get no warnings about how to safely prepare these exotic ingredients, so do your research first. Last summer I had an unfortunate run in with some Opuntia tunas. Ouch. Some of my other favorite stands. I really like the date guys. They sell some really fantastic varieties of dates, and even sell the not so ripe ones still on their branches when they are in season. There is an elderly couple who specialize in the most fantastic Asian Pears and persimmons. I had no idea Asian Pears were so tasty. There are several bakeries which sell sweet and not so sweet breads. Tomales Bay Oysters are usually there and will shuck to order. Hope to see you there some time! I have been wondering about this for some time, and especially since I am in southern California for a bit. To start off, I have been very, very spoiled by living in the San Francisco bay area for many years. I was fortunate enough to live relatively close to Berkeley Bowl and Monterey Market in Berkeley, and I shopped those places often. There are other places in Berkeley that the likes of are not found in southern CA, but maybe those for another time. I have gone to several produce markets that have been touted as being good, down here in the greater LA area. Sorry folks, they just don't even begin to compare. Most of them are about the size of Monterey Market, but they seem just run of the mill to me. They could be so much more, even in such a small space. My pondering leads me to wonder why there are not good produce markets like Berkeley Bowl and Montery Market down here in the southland... The fact that Berkeley Bowl has other great products as well, is not something that can be done just in Berkeley. Is it just a "Berkeley" thing? I think we have the same resources and availability of great produce and great products down here. Has no one ever tried to start up something like this down here? Is there a market for this type of market down here? I cannot see that there is NOT such a niche for these type markets.